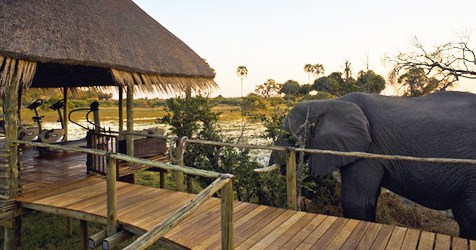 Wilderness Safaris is delighted to announce that in September, Abu, Mombo and Little Mombo Camps, situated in Botswana’s Okavango Delta, have been listed as 2015 Andrew Harper’s Readers’ Choice award winners in the Top 20 Safari Lodges and Camps category. Mombo and Little Mombo were also recognised in the Top 20 International Hideaways category. The results are based on the annual independent Reader Survey conducted by renowned luxury travel company and publishers of ‘The Hideaway Report’, Andrew Harper. Each year, Andrew Harper’s discerning readers vote for the best hotels, resorts, safari lodges and cruise ships around the world. This year’s Readers’ Choice Awards boast 122 hotels in 51 destinations. “We are extremely proud to be voted amongst the world’s best by the readers of Andrew Harper’s Hideaway Report. We are especially proud of our staff at the camps who continually go above and beyond to ensure that our guests experience a life-changing journey in these remarkable areas of the Delta”, said Grant Woodrow, Wilderness Safaris Botswana MD. “The awards are particularly important to us as they were voted for by the people who are most central to our business – our guests – and ensuring we exceed their expectations is something we seek to achieve in every respect of camp operations”, he added. Mombo and Little Mombo Camps offer understated luxury and Mombo is regarded as the flagship camp in Wilderness Safaris’ Botswana portfolio. The camps overlook a floodplain where large concentrations of wildlife can often be seen, such as giraffe, zebra, red lechwe, lion and spotted hyaena, to name a few. Morning and afternoon game drives are led by highly skilled Wilderness Safaris guides and offer some of the best game viewing in Africa. Abu Camp not only offers Africa’s premier elephant interaction experience, allowing guests to see and feel the bush through the eyes of the elephants, but also serves as an important research centre where the conservation needs and challenges of this most iconic of African species can be studied and understood. Andrew Harper’s Hideaway Report is a leading source of information about luxury travel, having provided candid and insightful reviews to its subscribers for more than 35 years.